The Grover Pro Percussion T2/GSPH 10″ Double Row Tambourine features German Silver and Phosphor Bronze tambourine jingles, double mounted premium white skin head, captive pin system, staggered jingle slot configuration, solid hardwood shell, and reduced width grip. A free tambourine bag is also included. Grover Pro’s innovative T2/GSPh was the first tambourine to fully integrate German Silver and Phosphor Bronze alloys in one tambourine. “Fully Integrated” means that each pair of jingles consists of both silver and bronze alloys. The jingles are voiced in alternating patterns, guaranteeing harmonious resonance. A superb, general-purpose instrument for those who want both highs and lows in one tambourine. Top Orchestral percussionists the world over consider Grover tambourines to be the “Stradivarius” of concert tambourines. Found in the world’s finest concert halls, Grover tambourines have been resounding with crystal-clear clarity and full, rich timbres for over 29 years. Meticulous craftsmen painstakingly handcraft each tambourine one at a time. This circular ring helps players easily create the friction needed to produce a smooth, even sounding roll. The 1″ wide band is specially shaped to conform to the outer edge of a headed concert tambourine. It has a special non-permanent adhesive backing that makes it super easy to put on and take off in just seconds! The Roll Ring is reusable and can be applied and stored numerous times. Good doing business with Steve Weiss, top quality. Every time I play this tambourine, fellow percussionist around me ask me what model it is and tell me how much they love the sound. Strongly recommended for someone's 'first' tambourine purchase. 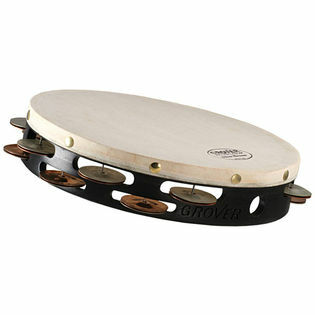 The Grover Germanic Silver/Phosphorous Bronze jingles provide an excellent sound for the tambourine. Not too bright, and not too dark. It sounds excellent! I will say this about the roll ring however.It provides itself as good training wheels for those who can't finger roll very well. But get off of those training wheels as soon as you can and get some bees wax on the head of the tambourine. The roll ring is made of straight sandpaper, and I did quite a bit of damage to my thumb when I used it. 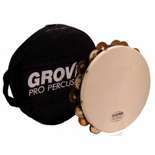 Any Grover Pro Tambourines one chooses will be the best sounding, and best quality, you will find. Period. Neil's instruments are the best - and so is he! Proud to perform with Grover products for all the orchestras and ensembles I am a part of. Go Grover Pro! Since the very first Grover triangles and tambourines were introduced several years ago, they continue to be the best products in their genre! I wouldn't trade mine for anything else!